Building a shoe collection – the pleasures! A friend of mine started investing in good shoes around six months ago. I find it reassuring that I get such vicarious pleasure out of it: perhaps I’m not as self-centred as all that. His first pair was a lovely set of mid-brown, cap-toe Derbys (above). It was a perfect first purchase – adaptable to casual wear, around the office and business meetings, with jeans, chinos and suits. Apart from charcoal they went well with all his suits, both grey and blue. I had a small role in this decision so it was a relief to see his delight in them. For his second pair, he was tempted with brogues in pale suede. But in the end opted for Oxfords in a hand-painted oxblood (above). Darker, sharper and smarter, they will go well with dark denim as well as blue suits, while retaining a little individuality. This seems to me like a great trio of shoes. Each will probably only be worn once a week, as the office is rather casual, so rotation won’t be a problem. Brushed after each use and stored with shoe trees, they should be the foundation of his smarter wardrobe for years. I can see them in my mind, sitting proudly in a row. Perhaps that gives me a little too much pleasure. But having introduced him to the world of classic footwear, it’s great to know his non-work wardrobe now has a grown-up option, alongside beloved trainers. And at work he will look far more professional. 1 – A suit that fits you. Good material tends to wear better rather than look tremendously better. So buy an inexpensive suit and have it altered everywhere so it fits. 2 – Buy decent shoes. This isn’t hard. In the UK just buy Loake, Barker or Cheaney to begin with, look after them well and trade up when you can. 3 – Buy good ties. Cheap ties look cheap. Get good ones, again look after them well and make sure they are tight to your collar. Those three things will change your look from graduate to junior management. Buy shirts, socks and expensive suits later. You can follow the discussion on Building a shoe collection – the pleasures! by entering your email address in the box below. You will then receive an email every time a new comment is added. These will also contain a link to a page where you can stop the alerts, and remove all of your related data from the site. The first shoe pictured is a Derby? I thought a Derby was something different. It’s the cap-toe, yes. It is strictly an Oxford as the quarters are not separate from the vamp, but it looks like a derby and is easier to describe as such. Simon great post. I really enjoy your blog. Quick question: in tip #2 you recommend buying loake, barker, or cheaney in the UK. Which US brands are of equivalent value? I’m afraid having never lived in the US (or bought US-brand shoes) I don’t know the answer. Alden and Allen Edmonds come highly recommended, but that’s about it. Do you know the Belgian shoe brand Ambiorix? Good post, and advice, thanks. Congrats on the Permanent Style blog top listing ….we’re huge fans of Mr Pask’s NY Times Mag blog ourselves. Re: the post, if it’s still under debate, technically the first shoe pictured IS an Oxford because the facings are stitched across (where the shoe laces up). If these were not stitched then it would be a Derby. A Derby is a better choice if you have a high instep as you can leave the laces opened more or if your feet swell a lot during the day, you can loosen them off. Same goes for flying – the Derby would be a better choice. Now, a New Year’s invitation to Mr Crompton… we’d like to invite you to our studio to see the new generation of traditional handsewn bespoke shoemakers in action! Hi Simon, great posts as always. As a striving young upstart in the legal profession I’m always on the lookout for ways in which to stand out from the crowd. Unfortunately, as a criminal practitioner, the wages are not at the level as some of the city types so I have to pick and choose whow and where to spend my hard earned wages. I was wondering if you could possible answer me a couple of questions. 1. I am in desperate need for some new work shoes, namely a black oxford for which to wear most days, alternating with a brown brogue. I recently came across some Church’s that I was severely tempted to purchase as they were half price. Would this be a wise choice considering the fact that they are still over £150? Or should I stick with a pair of Loake L1’s at half the price for the time being? One of the worries I have with the church’s’ is that the leather soles may wear out far too frequently and thus end up costing more. 2. I currently wear T.M. Lewin shirts from the John Francomb range as it is impractical to wear double cuffs when visiting prisons etc…do you have a preference for any brand and style of shirt within this price range? e.g. alternatives such as Charles Twhyritt? Or should I even re-consider ‘Jermyn Street’ shirts for simple M & S? Thanks for your time and I hope you can get back to me. Deborah – that would be lovely, I’d be glad to come in. Please contact me on my personal email – scrompton at iflr.com – and we can set up a time. OJ, I think the Church’s would be a great buy. They should last a lot better than the Loakes. On shirts, neither Lewin or Tyrwhitt are Jermyn St really. So go anywhere that makes nice shirts that fit well. For that price, I think it’s worth trying the M&S made-to-measure service. Great value for money. A question I wondered if you might help me with. In four weeks, my wife and I are moving to London from New Zealand. I will be jobless, and seeking interviews with management consultant firms. My question is about shoes. I have a half dozen made to measure suits in various navys and greys. In New Zealand, I have always worn them with dark brown and chocolate coloured shoes. Interviewing in London, should I play it safe and buy some black oxfords? Hi Anthony, my thoughts are that if you are heading for the world of management consultancy then go for brown. Why? Well knowing one or two as I do, it is a world (if you will forgive me) of the slightly enlarged ego! As long as your suiting is well and sharply cut, (not too NZ outback) then strut the dark brown stuff with pride. No doubt you will be working internationally, so keep some black for the more formal or conservative countries i.e. Italy, Dubai etc. I would recommend getting one pair of black oxfords, yes. While management consultants are not as formal as, say, lawyers, the majority wear black shoes in my experience, especially with suits. More importantly, for interviews you want to avoid any chance of your dress attracting attention. Simple, smart and neat. 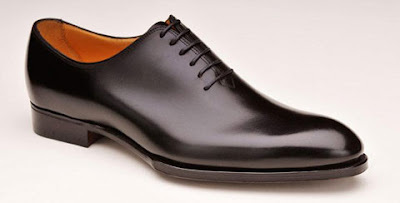 Black oxfords also have many other uses, such as wearing with black tie if you don’t have patent or pumps. Really interesting post, and great blog. I am currently building up a collection myself, but my big issue is with finding a good fit – I am suffering some slightly poorly fitted Loakes at present. Where could one go in London that would have a decent range across different brands, and good service to help me find a good fit? It seems like in most cases it is only the manufacturers’ shops that really help in finding the right last for your feet, and then only the more expensive ones (ie lodger etc). I can’t believe i haven’t read this blog before, it’s really good. Excellent blog, I’m looking for information on how to improve my health because I have some problems with my hair, so I would like to help me with advice on the subject, thanks! I know this is an old post, but what is the 2nd shoe pictured there? 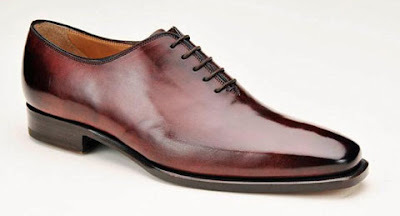 I have not been able to find a pair of oxblood shoes that look so clean. I’m afraid it’s from Lodger, which no longer produces its Italian shoes like this one. Why should you store your shoes with shoe trees? My understanding was that shoe trees should be used immediately after the shoes are taken off so that they can cool down, contract and dry out around the shape of a tree – once the shoes have cooled off then you can remove the trees as they are no longer needed i.e. you only really need to own one pair of trees – am I mistaken? Btw fantastic blog – I only found it yesterday and have already spent far too much time reading through old posts! The first few hours/day they are in is certainly the most important. That’s why you should buy one or two pairs and put them in every pair you’ve just worn if that’s all you can afford. But there are other benefits to storing them on them, such as avoiding any damage, and once you get trees that are specific to sizes or even bespoke, then you will need them too. Hi Simon, i stumbled across your blog recently and have really enjoyed your reviews, especially the visits to different manafacturers. From reading around I always got the feeling that C&J was highly respected (although not in the same league as Edward Green whose factory you visited in one of your blogs). Advice would be very much appreciated as im frustrated with my purchase! Yes, Crockett & Jones is very good, but no you shouldn’t be experiencing that. Did you wear them in slowly? Most places recommend 3-4 hours wear the first time you wear them, then building up to a full day. It may seem silly, but you are getting leather to mould to your feet in a way that will stay with you for years. Also try applying some cream, which will soften the upper slightly. If the problem persists, go and ask them in the shop. There may well be issues with fit that I can’t judge from here. Thanks for your reply Simon. No, I didnt wear them in slowly im afraid, as I wore them to and from the office it was became more like 9-10 hours at a stretch. The fit is perfect and the last works for my foot shape (358 last), I made sure of fitting issues by trying them on twice before buying. I think on looking back that it might be a sports injury (as im a keen runner) that has flared up with wearing new leather soled shoes for long periods of time (and foolishly running a couple of times in them to catch a train when brand new). Lodger don’t seem to make the first one anymore (in that colour anyway). Can you recommend an alternative in the same price range? I like to think that I’m a classic dresser but increasingly I’m getting the sense that I’m a conservative one! For example, I work in financial services and in all my years haven’t dared to deviate from black shoes for work. But I’ve read you extolling the sartorial virtues of brown shoes so often that I decided it was time to take the plunge. I was considering these oxfords from C&J http://www.crockettandjones.com/product/lonsdale-darkbrown which I don’t think are too dissimilar to what your friend purchased in 2009. Do you think they are suitably versatile? It would be great if I could wear them with navy/grey suits at work and jeans/navy chinos/grey flannels more casually but I I wonder if I am describing some mythical shoe that spans the formality spectrum. I know you said above that the shoes pictured were very versatile but I wonder if these C&J’s are too smart? Thanks as always for your time and help and please know that I found this old post easily thanks to the new layout and structure of the website. These would be fine with most navy and mid-grey suits, and flannels and probably chinos, but would likely be too smart for jeans. Building a shoe collection is indeed a great pleasure. The real pleasure however, comes from the knowledge that one has footwear for each and every occasion, having all the basics of formality and colour covered, and the confidence derived from that. I can vouch personally for the Northamptonshire-based shoe manufacturers being a wearer of Loake, Grenson, Barker and Cheaney. The difference between these makers and high-end makers is just remarkable but the difference between these makers and low-end shoes is astonishing which is why I believe that Northampton-made, Goodyear welted shoes are the best value shoes in the World.